In all honesty, trying to pick up and read the trades of Death of Superman, Reign of the Supermen and Return of Superman is not the world's best comics reading experience. A lot of assumptions were made on the part of the editorial and creative teams, there's a lot of in-continuity, DCU-of-the-moment stuff that will seem just bizarre to the casual reader. I was just getting into the Superman back catalog when I read it (again, I didn't really start reading Superman books til about 97), and I certainly wasn't reading Justice League anymore when these comics came out. So, by the time I got to the end of the story - via trade paperbacks - I was exhausted, and not in a good way. I've picked it up from time to time to check a reference or look at the art - some of which I dig quite a bit. But, the ending is gigantic, cataclysmic and a bit much, all told. And it ties not at all to the beginnings of the story, but to wide-expanse DCU stuff with no real forewarning or appropriate set-up for those who don't know who, say, Mongul is. Like those four Supermen, DC has felt that the drama of the Death of Superman is rock solid, and deeply meaningful somehow to the casual person on the street - which, I'm not sure is right. I mean, I think they're more like "wtf? Why would you kill Superman? No, I don't know anything about comics, please and thank you." So it IS a hook, as much as the sheer horror of much of the public when Thanos snapped his fingers. DC has put out at least one prior animated version of the story that was... fine. Nothing great. No new Supermen in that one, which really truncates the tale. And, of course, Zack Snyder's Batman v Superman famously co-opted the death to create a laborious first 90 minutes to Justice League - leaving a marketing department unsure what to do with selling a movie. Is Superman in it or not? 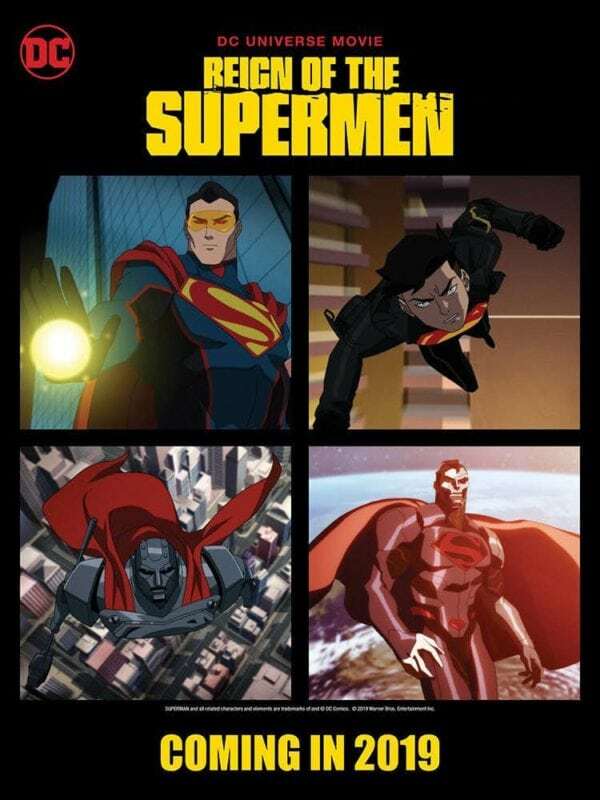 Reign of the Supermen is a direct sequel/ second part to 2018's animated Death of Superman cartoon. The two together are, honestly, the best version of the story I've seen as a self-contained, accessible story (but still part of the continuity of DCU Animated films) that manages to entertain and thrill, even when we know what's coming - sort of. It's just really smart, funny, action packed, maintains a mystery and rewrites all of Return of Superman so it's actually rewarding and makes narrative sense. While I miss the organic delivery that came part and parcel with Andrea Romano's voice direction - the actors don't always sound like they're talking to each other and it can be a bit flat - the movies contain well-drawn characters, introducing Steel, Superboy, The Eradicator and Cyborg Superman in terms that don't put them in a box, but do get their core down and understandable in a very limited run-time. We don't get all the side-business of the comics, which is fine, but we do get interlocking stories that bring the four together and get them interacting with some of our supporting cast. Of course I'm a fan that Lois Lane (voiced beautifully by Rebecca Romijn) takes center stage, dealing with her grief by doing what Lois always does: working to get to the truth and maybe risking her neck along the way. Her investigation into LexCorp and beyond is really the common thread pulling things together here, including partnering up with Dr. John Henry Irons (aka Steel). Wisely, DC Animation drops the Coast City storyline of the comics for something entirely new and novel (and very, very spot-on for the players involved) that provides a new motivation and threat for the Supermen to face and overcome. But, I ain't giving it away, because it's a genuinely neat reveal. I don't really want to write too much more about it - it's not Shakespeare, but it IS a great use of the notion of Superman, of what he can inspire in others as well as what he might inspire in the public (that may not go well for them). And, yeah, it has some really good animated action that feels spot on for the characters and their powers - let's just say 4 Supermans is a lot of duking it out.